"Today, we join Muslim communities in Canada and around the world to celebrate Eid al-Adha, which marks the end of the Hajj. "Eid al-Adha is a time to reflect on lessons of sacrifice and to show compassion to those in need. To mark the occasion, families and friends will gather to feast, attend morning prayers, and give thanks for the blessings they enjoy in life. "For all of us, Eid al-Adha is an opportunity to recognize the important contributions the Canadian Muslim community makes to our society, and to celebrate the differences that make us who we are. 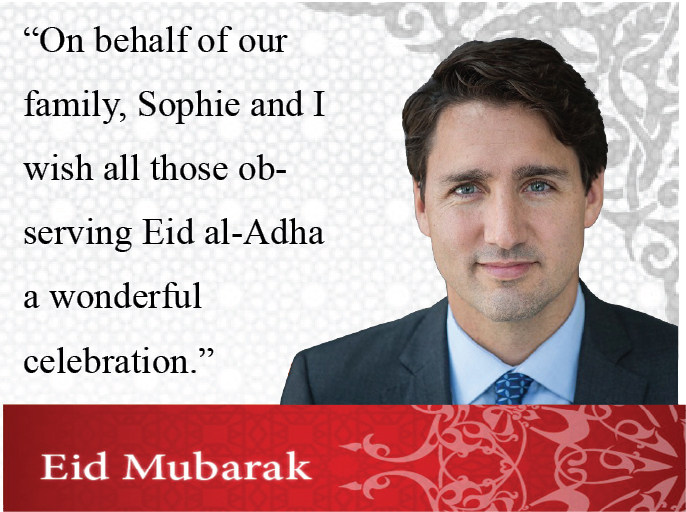 "On behalf of our family, Sophie and I wish all those observing Eid al-Adha a wonderful celebration.